Home / Events / BABAPRAISE STORMS THE CITY OF KANO WITH AKAIKATAN2018 "LIMITLESS PRAISE"
BABAPRAISE STORMS THE CITY OF KANO WITH AKAIKATAN2018 "LIMITLESS PRAISE"
Christ Heritage Crew, a Group of Talented and Christed vessels with the mandate of making men behold God as Our Culture. AKAIKATAN the concept for the revival of the African renaissance to promote the appreciation of the beautiful and wonderful creations of God. 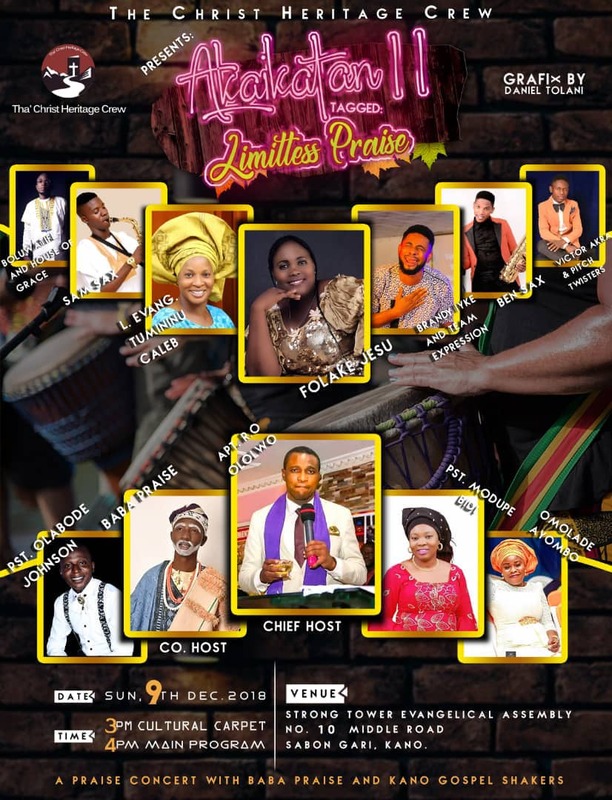 "Limitless Praise" the theme for AKAIKATAN II is a gathering of all men from various tribes in an atmosphere of praise to our only praise deserving God. Kindly Share on social media!